Things have been a bit quiet on Semiswede lately, and they become especially quiet in February as I gear up for my oldest daughter’s birthday. This year she turned six. I don’t know what it is about six years old that feels like a milestone. Perhaps it is because she will start school in the fall, and/or because all of her teeth seem to be falling out. Both are sure indications that she is growing up. So is this; last year, she was still in princess mode and wanted a Rapunzel party. This year, we jumped straight to pre-teen with Monster High. Admittedly, I had to look up what Monster High is all about. 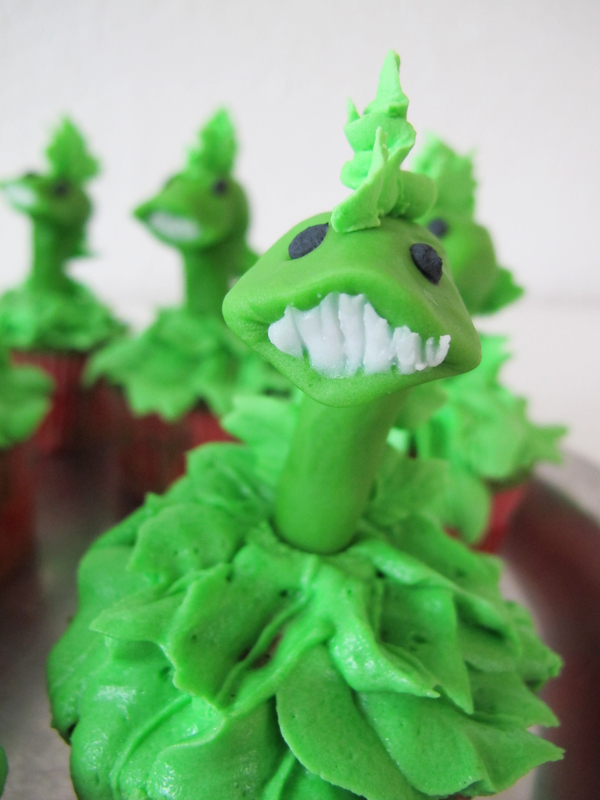 Once I did, I got excited about the possibilities and we decided on a Venus McFlytrap goes to the Prom cake complimented by Chewlian (her “scary plant”) cupcakes. When my daughter found a picture of Venus McFlytrap while surfing on the ipad, she found the hot pink and lime green hair irresistible. In my efforts to learn more about Monster High, I discovered they are manufactured by Mattel, the same makers of Barbie. Launched in 2010, the Monster High characters are teen children of monster parents. Venus McFlytrap is the daughter of the monster plant, like in Little Shop of Horrors. There are loads of other characters, boys and girls – daughters of Dracula, sons of werewolves, etc. Each character has a little bio. Venus McFlytrap is into bright colors, sustainability, and camping. I’m sure there are all kinds of anti-Monster High folks out there, as well as anti-Barbie. I personally think the concept of Monster High is pretty creative and fun, and I grew up with Barbies and don’t feel like I was scarred from that experience. But this post isn’t about a societal message or how these dolls potentially make young girls grow up with a poor self image, it’s really just about frosting. It was a blast to make this cake and cupcakes with my daughter’s help, and we used my mom’s frosting recipes that take me right back to my childhood. I grew up surrounded by cake decorating since my very talented mother decorated cakes “on the side.” It was never her profession, but more of a joyful hobby. There were lots of birthday cakes and many, many wedding cakes. In the 1980s, the wedding cakes were particularly elaborate with water fountains at the base and staircases cascading from a tower of central cakes to ancillary cake islands. When my mother was working on these cakes, she would have to slice the tops off of each layer to even it out which meant were loads of cake scraps. To compliment that, she would squirt squiggles of buttercream icing on our fingers. There was so much frosting and cake throughout the years that no one in my family is really interested in a traditional birthday cake anymore. We just kind of burned out cake and frosting altogether. But at this stage in my life, I am undergoing a buttercream revival. I don’t enjoy baking, but I really enjoy the decorating. Especially decorating cupcakes with my daughters. Now I squirt squiggles of frosting on their fingers, and I am passing on to them the art of how to decorate with traditional icing. I don’t have much experience with fondant, and quite frankly, I probably won’t have much more experience with it because I just think it tastes…well, meh. Perhaps I just haven’t had the right fondant? For my daughter’s birthday it was fun to decorate Venus McFlytrap’s prom dress, and I was happy with the visual result, but the fondant was so unappealing to eat that I knew we would need cupcakes with buttercream as a backup. The idea for the prom dress came from cakecentral.com. 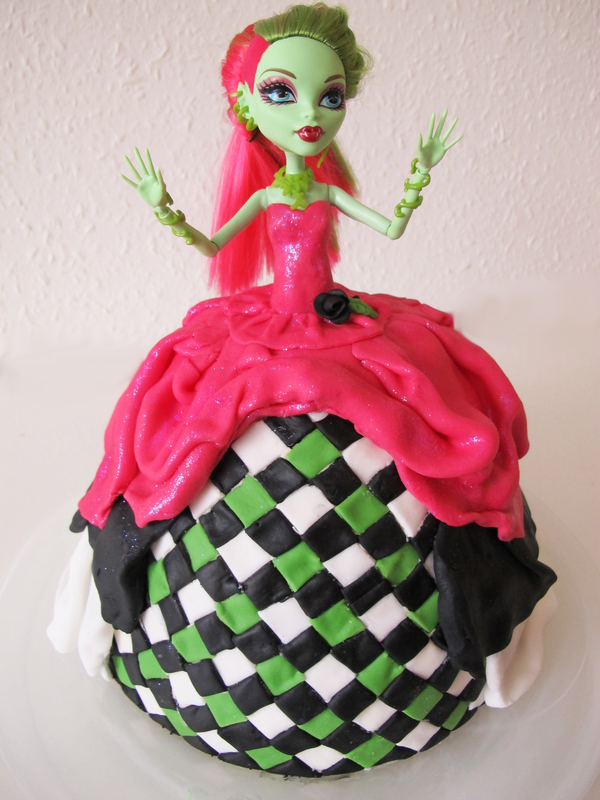 My hat is off to this talented fondant artist who inspired ourVenus McFlytrap gown (since my daughter is only six, I felt more comfortable playing down the skull part of Monster High). The Chewlian cupcakes were our own creation. 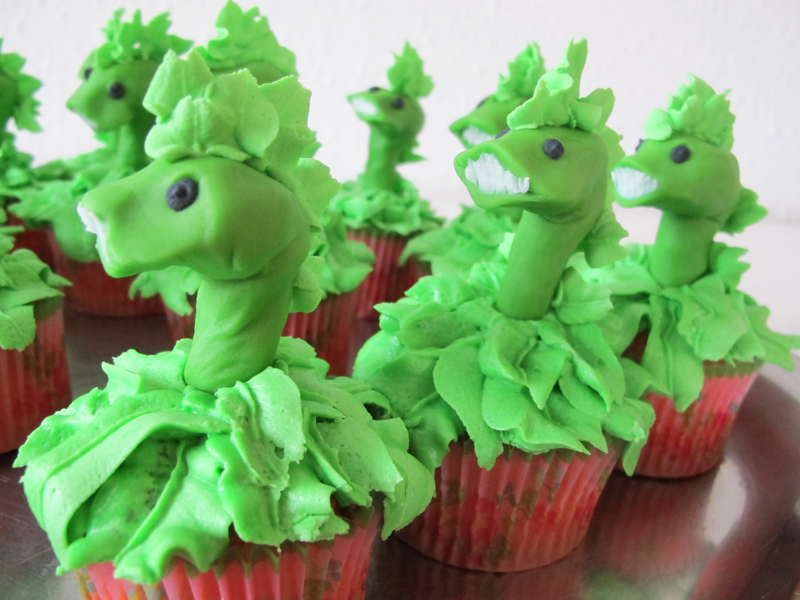 They are buttercream frosted cupcakes (which my daughter frosted using a leaf tip) with a head and neck molded out of one piece of fondant and stuck onto a straw for support. The mohawk is royal icing, as are the eyes and teeth (just drag a toothpick through the freshly piped white icing to make it look like teeth). The kids at the party didn’t even want to eat the fondant on the Chewlian heads. They just wanted the buttercream frosting. I mentioned last year’s creation was Rapunzel oriented. 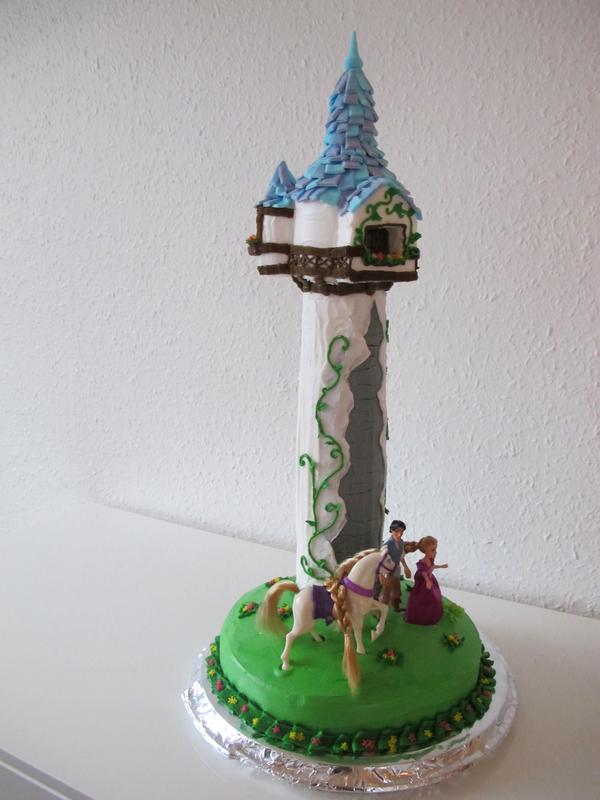 It was a tower cake inspired by another fondant creation at fairytale creations, but I made my version in buttercream and royal icing, only using fondant that I made out of a marshmallow for the shingles. It also helped to have an architect husband who sculpted the top portion of the tower with a foam cutter, and the tower itself is a piece of PVC pipe. 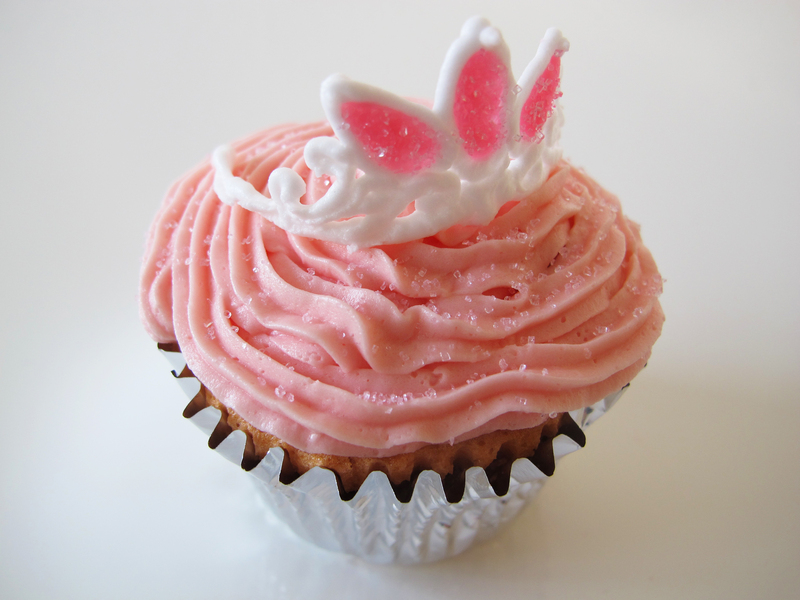 Last year’s cupcake compliment was royal icing tiaras. I drew a pattern from a Barbie Rapunzel crown, wrapped wax paper around a rolling pin, and piped on the frame of the tiaras before filling the open spaces with store-bought, pink glaze. So you can see that between these two frosting recipes, you can make some pretty fun and interesting creations. Throw a little fondant into the mix, say for shingles on a tower, and you have an arsenal to create cake decorating magic. I didn’t see any way this year that I could do the Monster High gown properly without fondant, but next year we will figure out whatever we are doing mostly utilizing these two frosting recipes. If someone has an irresistibly delicious fondant recipe they want to pass along and/or one they can recommend one to order, I’m all ears. But even then, I still might forego fondant, because there is nothing quite like squirting those squiggles on my little girls’ fingers, and listening to them crunch away on royal icing roses. Thanks mom, for teaching me such a fun skill. I may never decorate a wedding cake, but I am making some amazing memories with my kids, just like you did for us. This recipe is for uncooked buttercream that contains raw egg whites. If you are squeamish about that, there are plenty of other recipes you can look for on the web. In over 40 years, I have never known anyone to get sick from this recipe. You can make it with the vegetable shortening and butter mix, entirely with vegetable shortening for a super white frosting, or entirely with butter (my personal preference with vanilla extract). It is best not to refrigerate the frosting until after your cake is decorated. The frosting can sit at room temperature for 3-4 days. Avoid letting anything you have frosted sit in the sun, or it will melt (I speak from experience). Place everything in a standing mixer and beat on high speed until smooth. This is a stable icing recipe that sets up very hard. It is great for making frosting roses that will literally last for years as long as they don’t get crushed. It is also an excellent “cement” or “glue” for projects like panoramic sugar eggs, gingerbread houses, or mohawks on “scary plant” cupcakes. Place everything in a standing mixer and beat on high speed until smooth. If the icing is too stiff to work with, add a little water until it is possible to squeeze it through a pastry bag. Be sure to keep extra icing covered with a wet cloth or paper towel so it doesn’t harden before you are ready to use it. It is possible to store leftover icing for use the next day if you put a wet cloth on top of it in an air-tight container. Thank you for the Royal Icing one! That is going to be particularly useful for my boys’ cakes. I have been buying fondant icing from Pandora crafts, on online, but it really is sickly sweet stuff! You are welcome Helen. They are both pretty useful. Hope your family enjoys them as much as mine! Greetings from California. What wonderful memories you are creating for your daughter! I am not a fan of regular fondant either but have found a recipe for Marshmallow Fondant that is really good. Search for it on the web, and I’m sure you’ll find the recipe. It’s worth the extra effort of making the recipe because the flavor is far superior to the traditional. 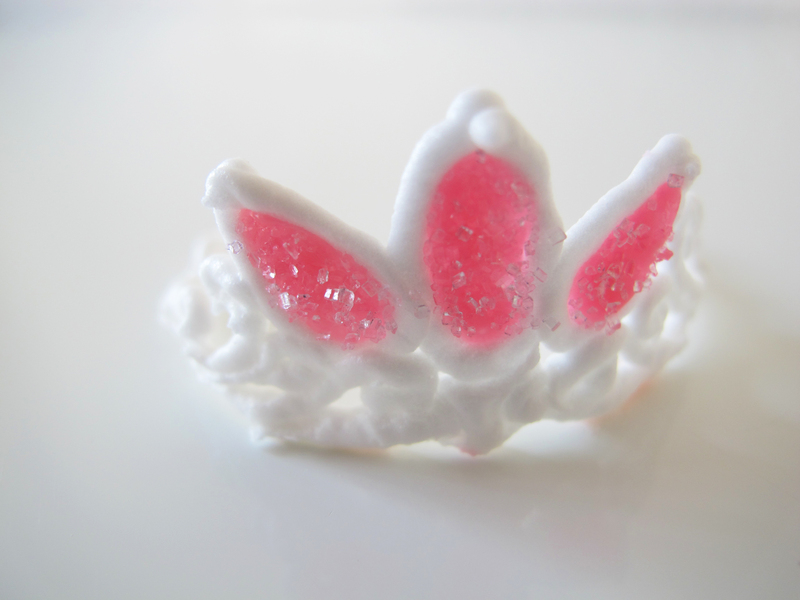 Thanks for sharing your way to make the tiaras which I will find a place to use–they are too cute! I really love your blog. Thank you for such a lovely comment. I tried marshmallow fondant once. I’m not sure it would have worked for the prom dress, but maybe it is worth giving it a try once again. Thanks for the encouragement. Good luck with the tiaras!